Wow! An amazing 197 schools sent in pictures of their efforts on the Earth Day Groceries Project in 2008. And 35 0f them were from Romania - go figure... If anybody knows what happened in Romania to cause this big spike, please let me know. Anyway, all pictures sent in have been placed on new web pages. We'll probably top 200 school submissions by the end of May, a record by a long shot. The issue is time. It takes an average of 10 minutes to convert and archive an email with picture attachments into a web page for a school. For 200 web pages, that's a lot of minutes - and way too many hours to add to my teaching life, even if I got paid for it :) Many thanks to all the teachers and group leaders who have sent in their pictures over the years - they are incredible! They will always remain on the website as testimony to the comittment of millions of schoolchildren to saving our Earth. I'll close this chapter in the project by sharng the very first picture from another school ever sent in to the web site. 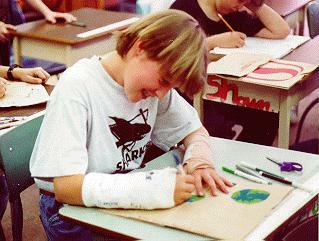 From 1996, Royston Elementary in Royston, BC, Canada - thanks, Kelsey!